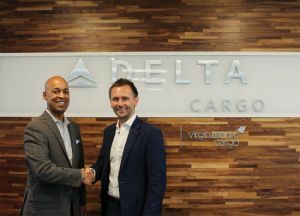 Virgin Atlantic Cargo and Delta Cargo are promising customers more choice, reach, and greater automation when they celebrated the fifth anniversary of their trans-Atlantic joint venture partnership. The said that they had already made a 20% increase in the number of services since the joint venture began, with 74 daily flights serving 28 routes between the UK and US, between them carrying over a quarter of total trans-Atlantic air cargo volumes. The two carriers are due to move their cargo operations into a new warehouse at London Heathrow later in the year and Delta is adding a new nonstop service from Edinburgh to Boston. Virgin Atlantic has scheduled an additional daily flight to Boston from Heathrow and is adding a new nonstop service from Manchester to Los Angeles and increased frequencies to Las Vegas, Boston and New York.